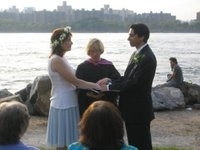 Many couples write their own vows, which is much encouraged. In addition, you may wish to exchange formal vows, perhaps before the personal ones which you have written to each other. Here are some examples of vows which show the reciprocal nature of a marriage commitment; mutual trust, respect, support - and an understanding that this is partnership which will weather the difficult times as well as the joyous events in your lives. our store of goodness and plenty and love." On this day, (month, day, year), I, (name), join myself to you (name), before this company. May our days be long, and may they be seasoned with love, understanding and respect. to be your (husband/wife) from this day forward. In laughter and in tears.